Based on reviews from 8,732 users. Learn how our rankings work or see our guide to K-Swiss sneakers. Updated Apr 2019. K-Swiss is one of those companies that has steadily been a relative part of the shoe culture for a long time, despite the dominance of its household name competitors. One may not recall any aggressive marketing campaign from the company, aside from a few athletes and celebrities listed as its endorsers. In fact, for at least two decades since its inception, K-Swiss focused on getting recognition via word of mouth and avoided any advertisements. Instead, the company believed in its footwear's performance and trendy designs to make up for the lack of media exposure. With the help of those qualities, K-Swiss sneakers were able to secure their relevance. More than half a century later since its existence, K-Swiss has ingratiated itself into one of the enduring brands in the sneaker industry. Thanks to its consistency of delivering artistic designs and notable support features, it has become an indispensable part of the tennis sneaker fiefdom and more recently, lifestyle sneakers. 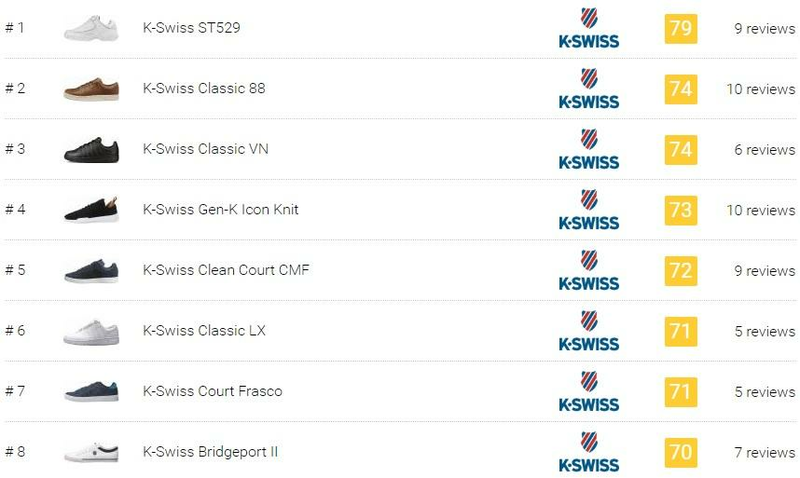 Below are some of the remarkable K-Swiss sneakers divided by classification. These are the collection of K-Swiss sneakers that is best suited for training or gym workouts. Price range starts from below $50. As for the size, the trainers are available in US men’s from 6.5 to 15. For women, sizes are offered from 5 to 11. Listed below are few examples of the best-rated trainers for the brand. ST329 CMF– This is a modern rendition of the original tennis K-Swiss sneaker, and has since been considered as a cult-classic. Built to last, this training shoe is packed with support features to ensure optimal performance. Offered for both men and women, with over a dozen variations of colorways, and design nuances, it is reasonable to think that this is the brand's premier trainers. Tubes Infinity CMF – Style-forward looks with unmatched comfort defines these trainers. Designed for active lifestyles, this shoe has a mesh upper and reengineered cushioning technology system which garnered acclaim from its wearers. ST429 – The limited-edition ST429 exhibits a flamboyant colorway, and available for women only. The shoe’s innovative overlays, mesh panels, and premium memory footbed contributes to its impressive support and comfort. Gen-K Icon – A K-Swiss shoe line that displays a contemporary silhouette that looks excellent for a new class of entrepreneurs and up-and-comers who are driven by style and success. The EVA outsole has been consistently utilized for this collection. Aeronaut – Sports performance combined with a street-style design is definitely an ongoing theme not just for K-Swiss sneakers but all brands. The easy to style Aeronaut shoe is no different. Its design has been meticulously crafted to provide the eye-pleasing aesthetic and supreme support features. Overall, it is an excellent choice for an everyday sneaker, because of its athleisure looks and dynamic comfort. Many of the marquee footwear companies regard their collection of classic shoes as the crowning jewel of their brand. In the case of K-Swiss sneakers, there are some notable models that surpassed the test of time and continues to be a part of the lifestyle culture since its inception. For this category, the price of the shoes starts from $50. US men's sizes are offered from 6 to 15, while women can avail theirs from 5 to 12. Classic 88 – One of the first K-Swiss shoes, which was introduced in the 60s. Its simplistic silhouette has an enduring appeal and has been on production up to this date. For casual wearers and fans of the brand, there aren't many reasons why anyone cannot consider owning a timeless and comfortable shoe like the Classic 88. Classic VN – K-Swiss refers to the Classic VN as the brand's signature shoe, the ultimate classic. This vintage product was being utilized for tennis, but its casual version has been a staple on the shoe shelves for many people. Many of its colorways are monochromatic, which grants a pristine and distinct appearance. The Classic series is arguably the most integral part of the K-Swiss sneakers collection. Hoke CMF – A classic tennis-inspired casual shoe that works best for day-to-day wear. It bears some resemblances to the other K-Swiss products appearance-wise, but its affordable price makes it stand out for those who are on a budget. In general, K-Swiss sneakers are budget-friendly. Classic 66 – This shoe has been a part of heritage American tennis due to its innovative support features. Since its introduction to the public, the Classic has gone through some nuances in material and silhouette, but still maintaining its trademark and timeless aesthetics. This model is one of the K-Swiss sneakers that has multiple collaborations under its name. Court Frasco – The Court Frasco from K-Swiss exhibits a high-style look with a design that is based on K-Swiss' tennis heritage. Its details boast a fashion-forward element, elevating the classic looks with modern sophistication. Many wearers are fond of this sneaker due to its style, comfort, and a very agreeable price. K-Swiss shoes have a variety of offerings for those who are aiming to be modernly fashionable. Aside from the eye-catching trendy designs and impressive support, many of its footwear are affordable. To be specific, customers can buy some K-Swiss sneakers for below $50. Sizes available for US men's are from 6 to 15. Women's sizes start from 5 to 12. Listed below are a few K-Swiss sneakers that amassed positive feedback from its users. Baxter – The eye-catching Baxter has a striking contrasting color scheme, which are more than enough to create a heightened visual interest. This is an example of those K-Swiss sneakers that is labeled as a classic athletic shoe. High Court – These kicks gives off a luxurious feel due to its fine stitching and leather upper. Handcrafted in Portugal, the High Court is a great addition to anyone’s arsenal because of its clean and elegant appearance. Dani – Another one of K-Swiss shoes that is court-inspired. This low-top Dani boasts a touch of feminine details and street-worthy qualities. Offered in light colors, this shoe has captured the attention of women everywhere because of its modest and pristine design. ST529 – This casual footwear is the latest evolution of the brand’s original Classic tennis shoe. Aside from its contemporary design, its dynamic support features of the ST529 ensures comfort with each step. K-Swiss sneakers seem to always have that tennis heritage embedded into its models. Nova Court – Built for the modern lifestyle, this shoe has a contemporary minimalistic look with some subtle classic particulars. The asymmetrical perforations on the lateral midfoot area give a degree of distinction to its low-profile design. K-Swiss takes pride on its tennis heritage. Its brand-defining product, the Classic, is the brand’s first sneaker, which is designed for playing tennis. Due to its success, many of the K-Swiss sneakers have been inspired by this vintage footwear. As the company strives to strengthen its presence on the tennis landscape, here are some models that solidify its association with the sport. Knitshot – Utilizing the best available cutting-edge materials, the Knitshop is designed for playability and comfort. This tennis shoe is best suited for those who have a very aggressive playing style, as it can withstand and support the complex movements needed on the court. Hypercourt Express – Performance and comfort are the inspiration for the Hypercourt Express. It exhibits a lightweight construction and some of K-Swiss’ signature technologies on its soles to appease wearers on any surface. Court Smash – While this shoe also showcases a few of the brand’s trademark tech, what makes this tennis shoe special is its budget-friendly price. The neutral colors on this shoe and the simple design seems to be appealing to some users. Most of the shoe brands have its own set of technologies to enhance or boost their products. K-Swiss is no different. Listed below are some of the brand’s technologies and its corresponding function. Also noted are a few K-Swiss sneakers that has the specified tech. Comfort Memory Foam (CMF) – K-Swiss signature footbed which ensures optimal all-day comfort. A handful of K-Swiss sneakers have the CMF attached to their names. Examples of K-Swiss shoes that has the CMF are ST329 CMF, Hoke CMF, and Court Pro II CMF. Tubes – Utilizing tubular structures, K-Swiss produced its own dynamic cushioning concept. A shoe line was launched to introduce the tech to the public. Tubes Infinity, Tubes Millenia, and Tubes 151 are some of the K-Swiss sneakers that have the Tubes. Flow Cool System – An upper construction that offers impressive breathability while also delivering essential support and protection. Flow Cool System is utilized in the following shoes, the BladeLight and Blade Foot Run. GuideGlide – An exceptional midsole construction which helps to align the foot to the center, providing a more stable wear. These K-Swiss products make full use of the GuideGlide: Knitshot, Hypercourt Express, and Ultrashot. K-Eva – Midsole tech that grants supreme cushioning and durability. K-Eva is consistently used on the Aeronaut series. Aosta – A high-density rubber outsole which is designed for high-level durability and traction on various court surface. Shoes like the Functional and Infinite Function are made better with the inclusion of Aosta rubber on its outsole. Collaborations are an integral aspect of promoting and elevating the stature of any shoe brand. It is a fusion of ideas and concept between the sneaker company and a well-known figure, usually an artist, celebrity, athlete, or in some instances, an apparel company. K-Swiss was able to made a few notable collaborations that further embellishes its prestige. Below are some classic K-Swiss sneakers which have been reiterated with modern features, that matches well with today’s fashion lifestyle. DNCE is a multi-platinum selling band that consists of 4 members. Each of them represents classic K-Swiss footwear that are updated with their own concepts . Gen-K Icon Knit “Come Find Me” DNCE with Joe Jonas – Jonas is the frontman of the band and its most prominent member. The K-Swiss x DNCE Gen-K Icon Knit is about contrast. A striking combination of black and a pinch of red which pays homage to the band’s trademark look. Classic VN “Disco Kicks” DNCE with JinJoo Lee – Lee is the guitarist of the band. The K-Swiss x DNCE Classic VN is built for fun and function. Making a nod to this collaboration, the DNCE’s trademark colors accentuate the brand logo on its tongue and heel tab. ST329 “Everybody” DNCE with Cole Whittle – Whittle is the bass player of the band. The K-Swiss x ST329 DNCE is a reimagination of a classic sneaker that exhibits a dominant white color, and still has the features of quality support and cushioning of the original. Irvine T “The Lawless” DNCE with Jack Lawless – Lawless is the drummer of the band. The K-Swiss x DNCE Irvine T has the aesthetic of an everyday go-to sneaker but also has a touch of distinction. D-ring loops adorns the lacing while the gum toe box offers durability. A Bathing Ape is a Japanese apparel brand founded in 1993 by Nigo. One of its secondary line, the AAPE by A Bathing Ape, made a collaborative sneaker with K-Swiss. One of the best K-Swiss sneakers, the Classic ’66, got revamped by having a camouflage pattern with A Bathing Ape branding across the heel. UBIQ is a Philadelphia-based sneaker shop that has a track record of partnering up with lesser-known brands. Gstaad is one of the first K-Swiss sneakers which is built for playing on the court. The UBIQ x K-Swiss Gstaad is offered limitedly in two tonal colorways. This kind of collaboration is rather unconventional. As mentioned above, collaborations are usually with athletes, celebrities, apparel companies, or artists. Vaynerchuk is none of those. He is an entrepreneur. To top it off, there are two K-Swiss sneakers under his name, the GaryVee 001 and GaryVee 002. While some are not sold on this type of collaboration for now, maybe this will be a trend in the future. Anwar Carrot was the creative mind behind the Los Angeles streetwear brand Peas & Carrots International. The label is famous for its pop graphic shirts that have a cult following. Popular lifestyle websites such as Complex and Hypebeast covered its products, adding to the brand’s exposure. Eventually, Carrots started his own label, named Carrots by Anwar Carrots. Classic 66 Japan is one of those vintage K-Swiss sneakers that has displays a monochromatic color scheme. The brand teamed up with Anwar Carrots for a collaborative work to make the Carrots x K-Swiss Made and Japan Classic 66. This sneaker takes a modest approach between elegant styling and streetworthy attributes. Essentially everyone loves wearing sneakers, but that enthusiasm may not apply when it comes to cleaning or maintenance. Those light and assorted colors pose a challenge to look dirt-free, but with a little bit of effort and knowledge, anyone may have the means to preserve the beauty of one’s favorite pairs. Below are a few tips and instructions on how to clean K-Swiss shoes. Before wearing those brand-new K-Swiss sneakers on the street, it is a feasible option to waterproof them first. Purchase a Carbon Protecting Spray and coat those pairs two up to three times. Not only it will provide a degree of protection against moisture, but it also hinders the dirt from penetrating deep into the shoe’s exterior. Additionally, waterproofing makes cleaning the K-Swiss sneakers much easier. Shoes getting dirty is almost inevitable, especially for those that are used outdoors. If the K-Swiss sneakers are already dirty, here are the steps on how to properly clean them. This is the easiest part of the shoe to clean. Put it on the washing machine and let them air dry. This will work on most instances but if there are lingering dirt, brushing it carefully will do the trick. 2. Be knowledgeable of the materials on the shoe. The upper part of the K-Swiss sneakers are usually consists of real leather, synthetic leather, or canvas. Canvas is easy to identify, but for the leathers, the sense of touch and smell needs to be used. Synthetic leather feels rigid and has a chemical smell. The real leather feels soft and has a distinct smell. 3. Stuff the K-Swiss sneakers with tissues or paper towels. It is paramount to not use any paper that has any sort of print as it may blemish the shoes. 4. Start cleaning the shoes. Leather K-Swiss sneakers: Use cleaning wipes as much as possible because the leather can dry out over time and will become sturdy. Once the shoes are clean and dry, polish them with the color that matches it. Canvas K-Swiss kicks: Use a generic toothbrush soaked in shoe cleaner solution. Gently scrub until the dirt or stain is gone. Suede K-Swiss shoes: Using a suede gum, wipe off the dirt and grease stains. Avoid the suede gum from getting wet as much as possible. But, if there are stubborn stains, slightly soaked the suede in a shoe detergent with water, and start scrubbing gently. The shoe must be dried by using a microfiber cloth. 5. Drying the K-Swiss shoes. Never let the K-Swiss sneakers be dried under the sun as it will speed up the oxidation process. Oxidation will turn shoes’ color into yellow. Though it is bound to happen for all sneakers, everyone wants to delay it as much as possible. How did they come up with the name K-Swiss? During the 60s, kids from Europe spelled California with a K, instead of C. The founders Ernest and Art Brunner used the initial and added their nationality, thus conceptualizing a unique and catchy brand name. It also embodies the fusion of the lifestyle look of the US and the Swiss heritage of its founders. Does K-Swiss also have great offerings for women? Definitely. Most of the brand’s bestsellers are available for both men and women. Some trendy K-Swiss sneakers are specifically designed for women only, and many of those have received positive remarks. What is the price range of K-Swiss sneakers? For most of the models, it starts from more or less $50 up to $180. Even for its signature K-Swiss sneakers, the price tag appears to be reasonably priced. It might be worth it to check the official website at times because it offers various products at a discounted rate. Some find the brand to be a better alternative to some of the more popular labels because of its wallet-friendly offerings. Are there any recommended K-Swiss shoes for those who have wide feet? There is a Wide Style category on the brand’s official site. There are a good number of K-Swiss sneakers that is made for both men and women under this collection. What is the most popular shoe line of K-Swiss? K-Swiss recognizes the Classic shoe line its signature collection. With dozens of reiterations and collaborations over the years, it is easy to tell that by far, it is the brand’s crowning glory. What is the Generation-K Campaign all about? It is a collaboration in 2017 between the brand and young entrepreneurs, namely Anwar Carrots, Coco & Breezy, Karen Civil, and Elliot Tebele. This campaign aims to promote the new “hero” sneakers, which are Icon Knit, Court Frasco, and Icon 66. The footwear company was acquired in 2013 South Korean company named E-land World Ltd for about $170 million. What is the inspiration behind the viral commercial K-Swiss MFCEO? In 2011, veteran comedy actor Danny Mcbride starred in the promotional videos for the K-Swiss Tubes and K-Swiss Blades. He reprised his character Kenny Powers, the foul-mouthed and obnoxious former athlete in the HBO comedy Eastbound & Down. Powers has a wild succession of ideas to promote the shoes. The majority loved the randomness and the overall fun of the commercial. Some even commented that this kind of marketing should be considered when advertising other K-Swiss sneakers.